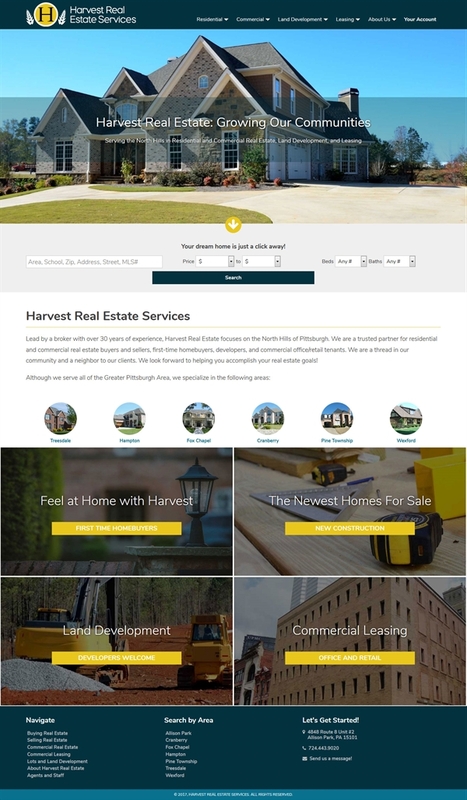 As a brand-new real estate company, Harvest Real Estate Services was looking for a full-service agency to help them get established online. The Joyce, Inc. team provided a from-scratch site design and wrote all content for the site with one thing in mind: community. During our initial Discovery meetings with the Harvest team, we heard over and over that "community" was the foundation of their business. There were two reasons. The first was that they wanted to position their agency as a vital thread in the North Hills neighborhoods. They wanted to be so deeply embedded in the North Hills communities that everyone would know them, work with them, and recommend them. We accomplished this positioning by writing site content with a warm, neighborly feel that would reassure and inspire confidence, especially for first-time homebuyers. The second reason "community" was a focus is because they wanted to target specific communities with their website. To accomplish this goal, we wrote dedicated landing pages for each of their target neighborhoods. Each landing page contains information about the neighborhood written with SEO-best practices, as well as a gallery with 24 of the newest listings in that area. The user can click any listing for full details about that specific property, or search all homes in the area.